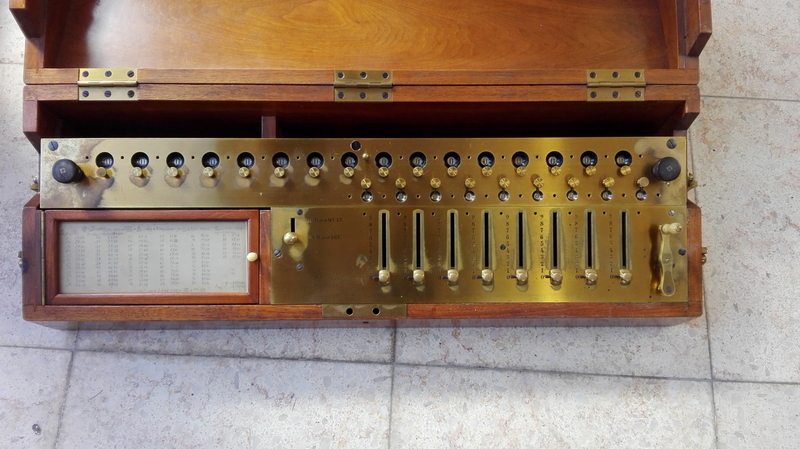 This somewhat puzzling machine hails from Sweden. 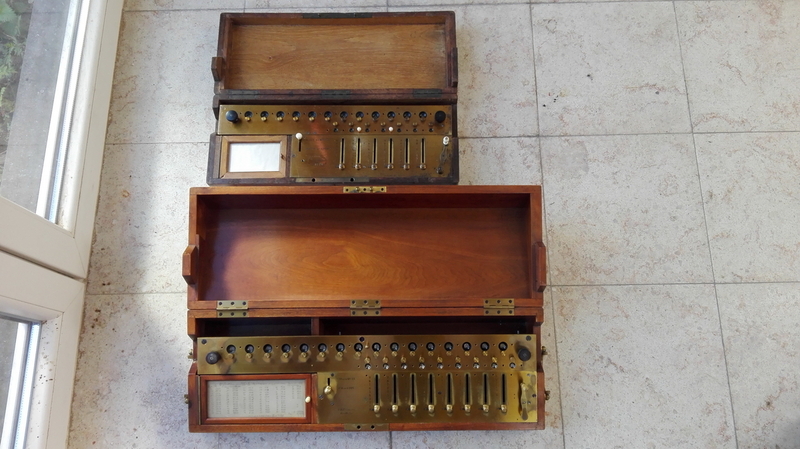 G.F. Sörensen was an instrument maker, active in Stockholm from 1873 to 1908 (source: Tekniska Museet, Stockholm). 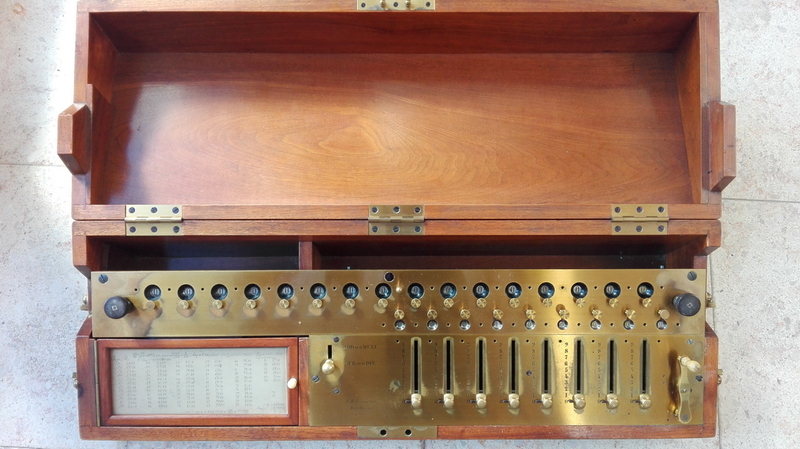 The museum has four of these machines, there is one in the Arithmeum in Bonn, and then there's this one, bought at auction in Stockholm in 2019. 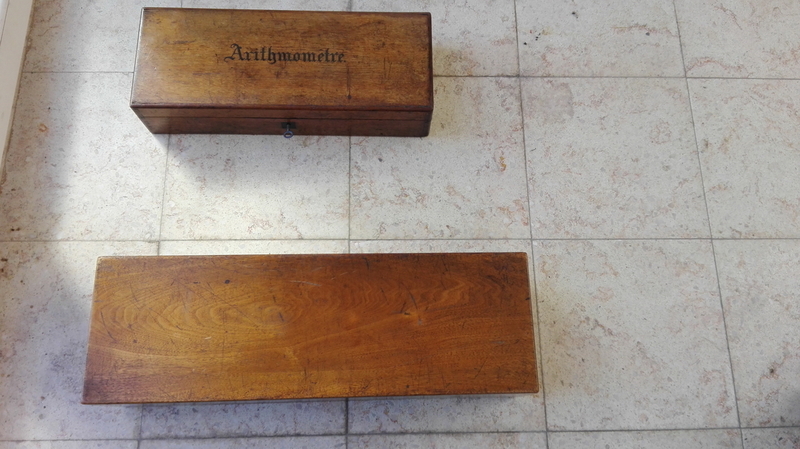 At first sight, it is a direct copy of a model 1865 Thomas Arithmometer, or could even be imported from France, as a whole or in parts, and engraved in Stockholm. 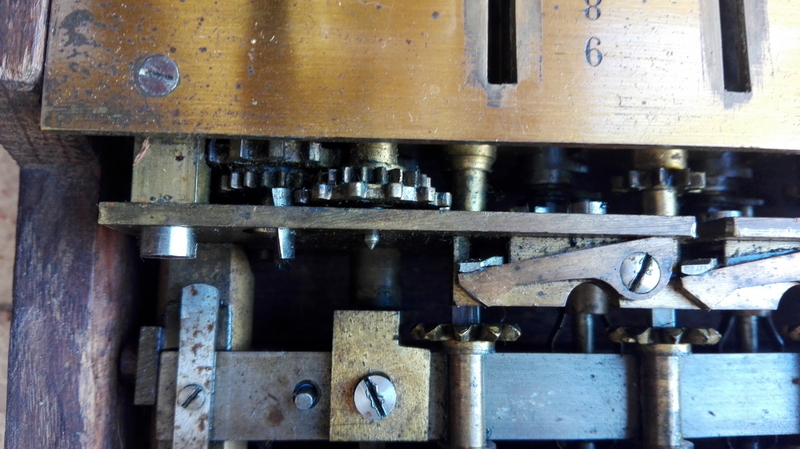 Looking at the machine closely, I am now convinced that G.F. Sörensen indeed copied a Thomas Arithmometer, but he did so very carefully and not by using parts from France, improving things he did not agree with, which leads to a machine that is more esthetically pleasing, and some aspects of which are less sketchy than the french original. 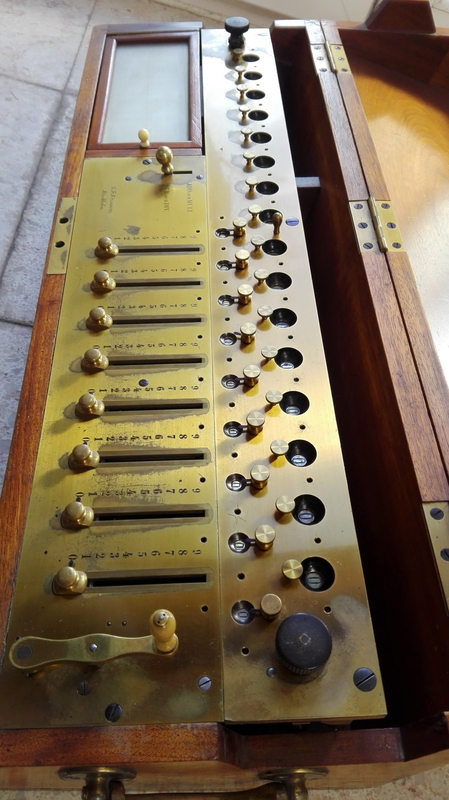 The quality of the machine is second to none - G.F. Sörensen obviously took pride in his work, and was used to making fine brass instruments. 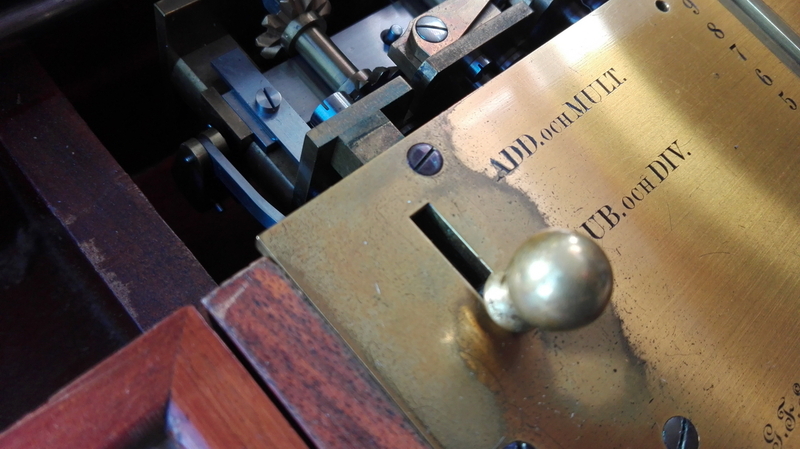 The Tekniska Museet also has an Amsler polar planimeter made by him. 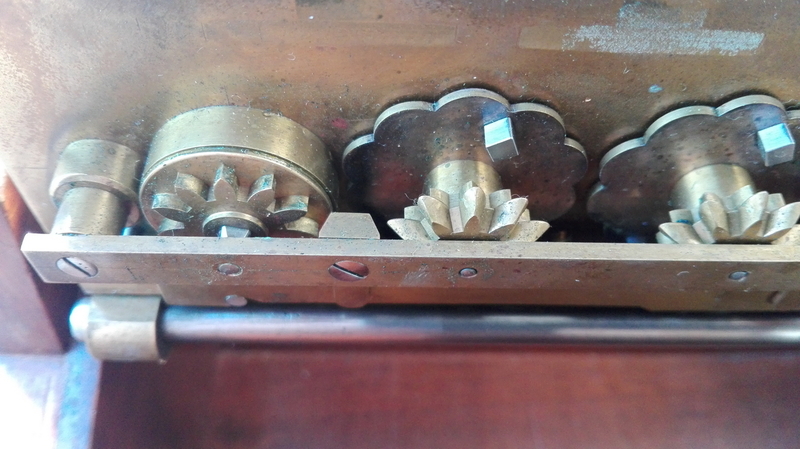 Looking at the machine, the surface finish of the top plate is much better than in the Thomas production, all the edges of all the parts are crisp and sharp, the engraving is beautiful and of top quality, every single screw is blued - a lot of time and skilled work was invested in this machine, and the price must have been steep. 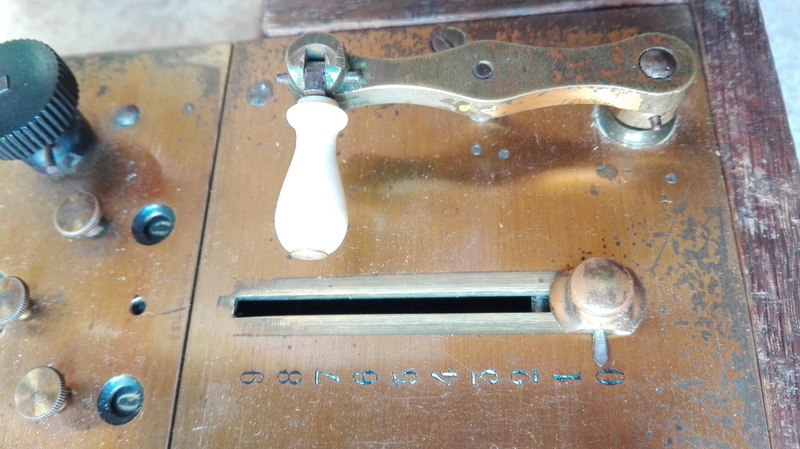 The machines carry no serial number, at least not on the metal parts, but in my own machine there is a number painted in white paint on the inside of the lid - 188. 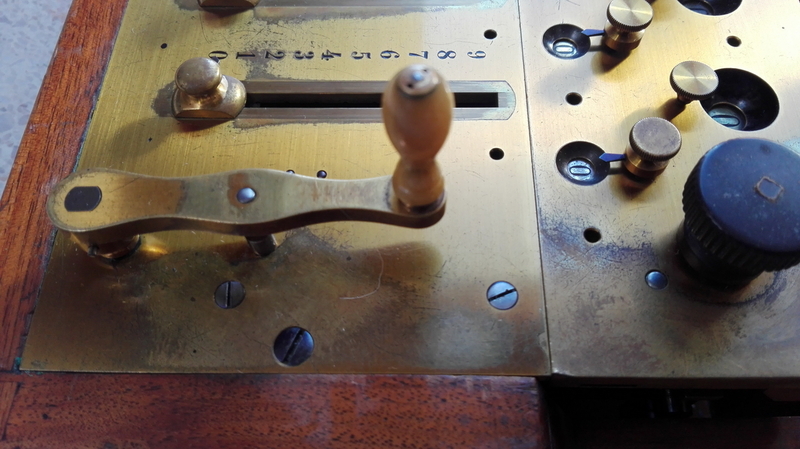 Some of the machines in the Tekniska Museet are known to have been ordered in 1902. 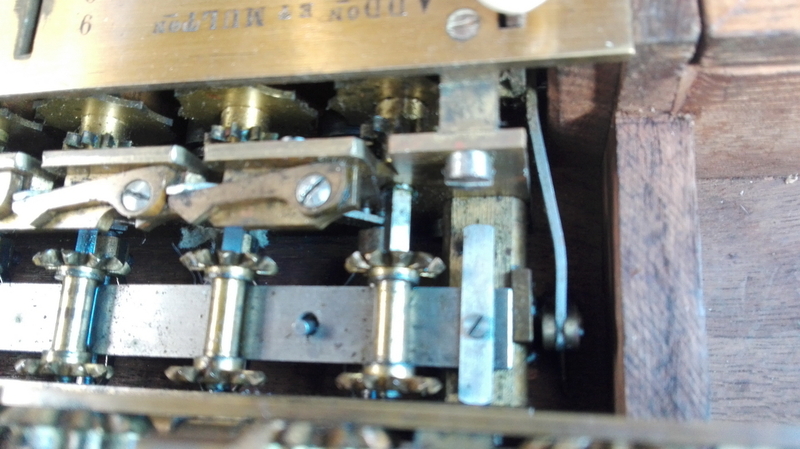 They all have large numbers engraved on top of the carriage, which my machine does not (yet) have. 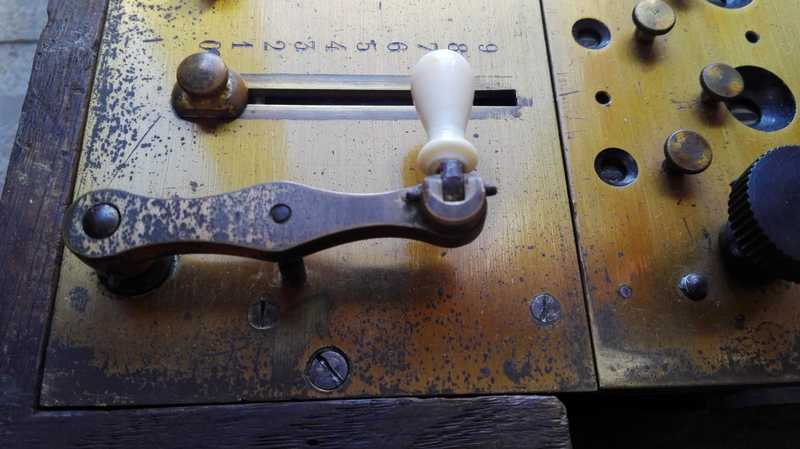 Some of the dates mentioned by the Tekniska Museet point to manufacturing dates as early as 1896 or 1895. 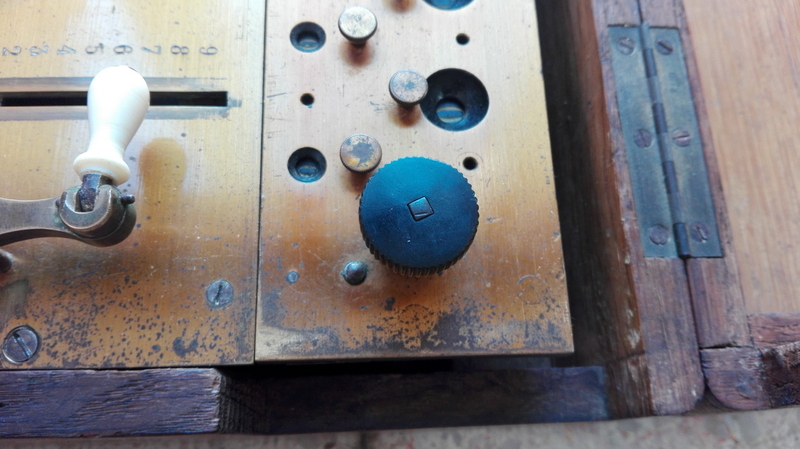 I think my machine thus is earlier than 1902, at the brink of the 20th century. 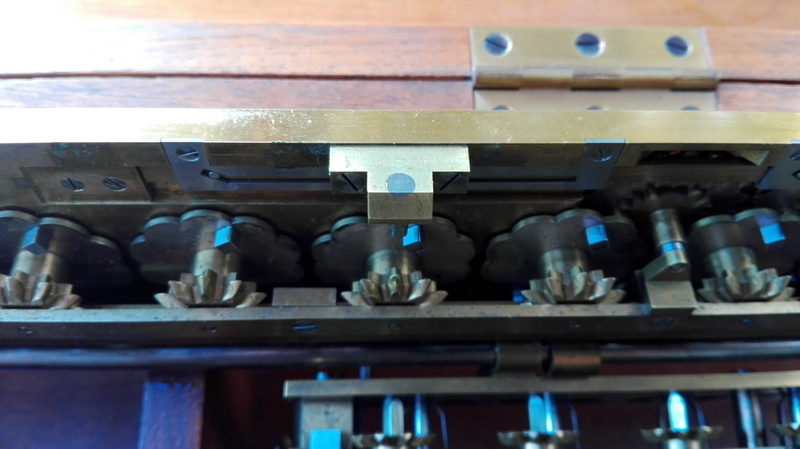 The case for the machine is a different design than the Thomas ones. 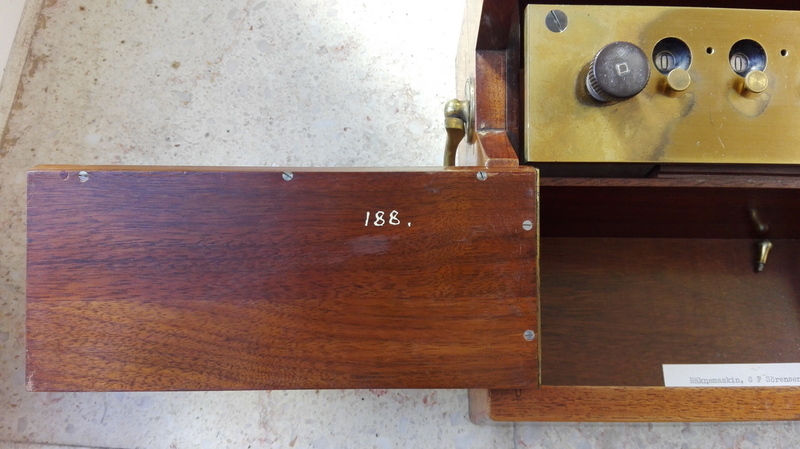 It appears to be coloured walnut, resembling mahogany especially on the inside, where the reddish varnish has not been bleached. 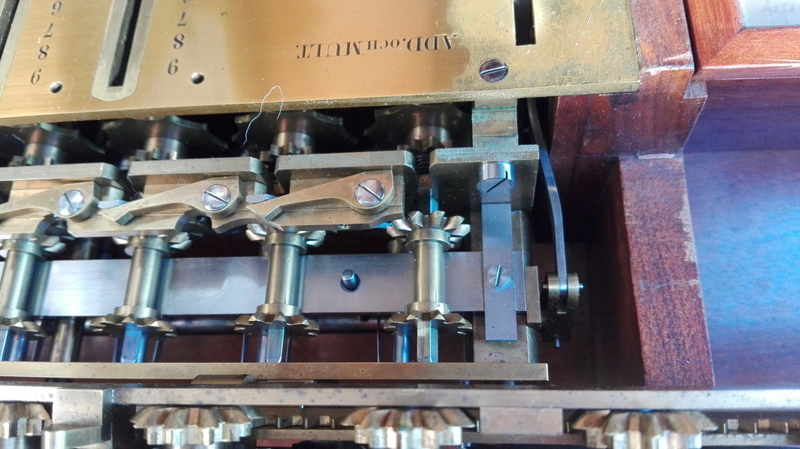 The machine is tilted towards the user in the case, and the front of the lid is high enough not to need a fold-down main crank like the Thomas machines. 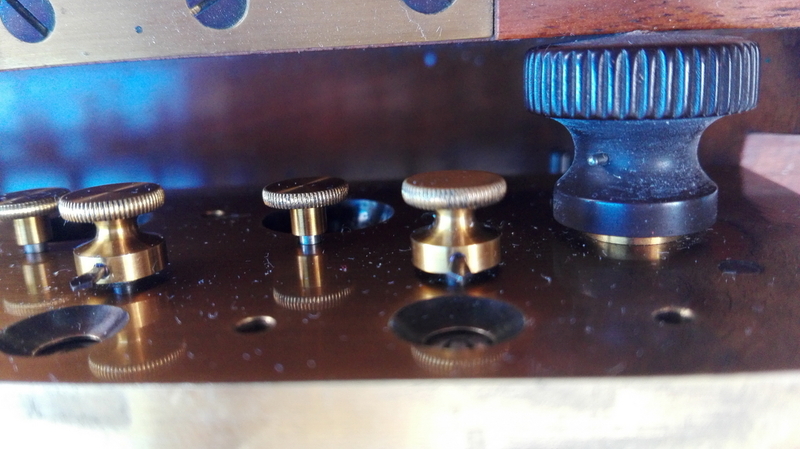 Instead of rivets, the drilled brass pieces for the carriage rail use screws to connect to the carriage in the Sörensen machine. 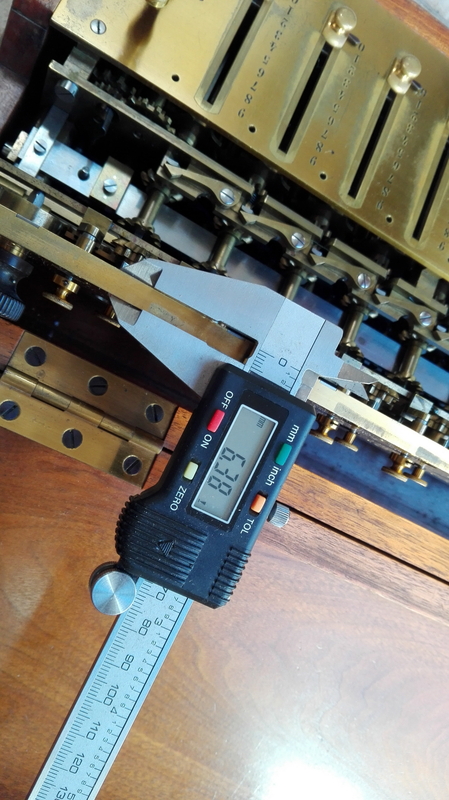 The thickness of the brass top plates, both of the carriage and of the machine itself is thicker in the Sörensen (6.38mm, 3.24mm) than in the Thomas machine (6.11mm, 2.85mm). 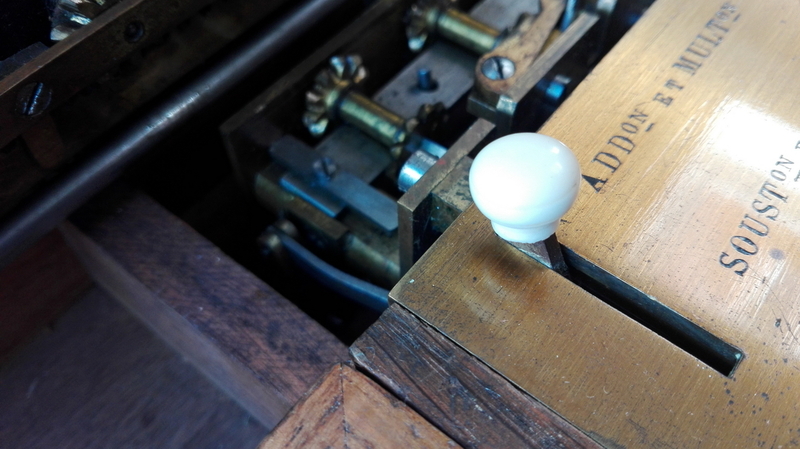 The main crank handle is held on to an axle with an elongated cross-section in the Sörensen, in the Thomas, the axle is round. 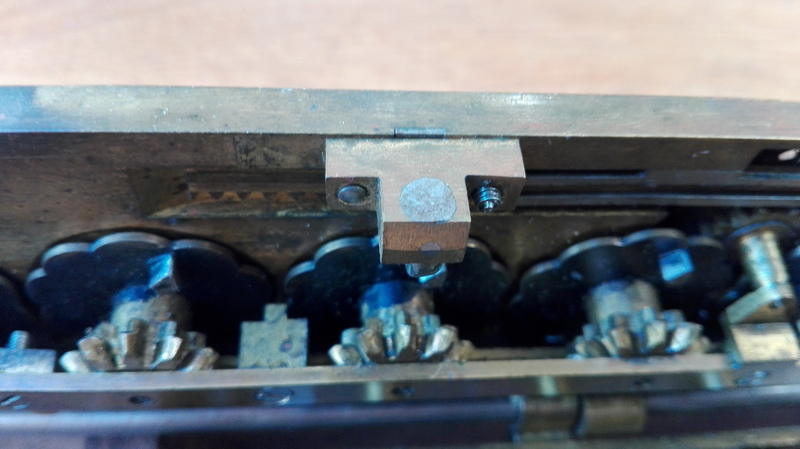 In the Sörensen, there is no bushing protruding over the level of the top plate, in the Thomas, there is. 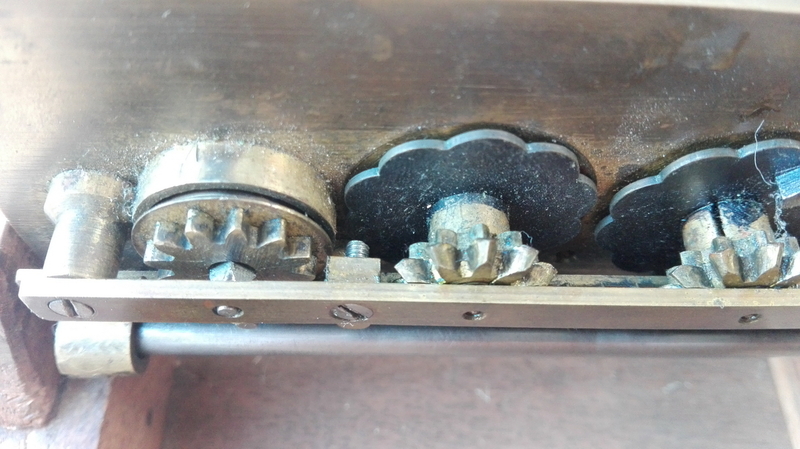 The locating pin for the carriage is screwed from the bottom in the Sörensen, and from the top in the Thomas. 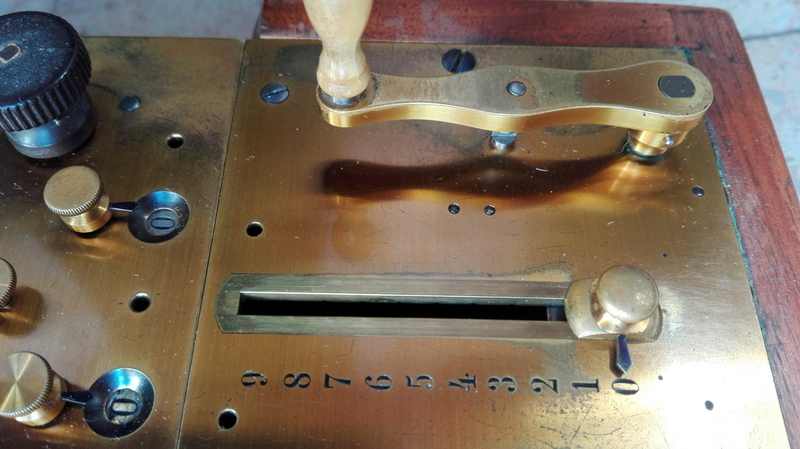 The "twirler" knobs for the counter register are a different design in the Sörensen, and they have a blued steel pointer, the Thomas ones do not. 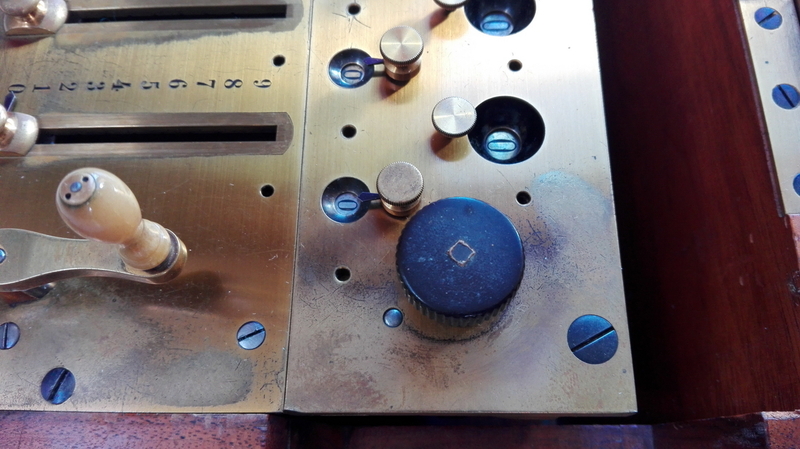 All of the gears have a much nicer finish in the Sörensen, as does the machine in general. 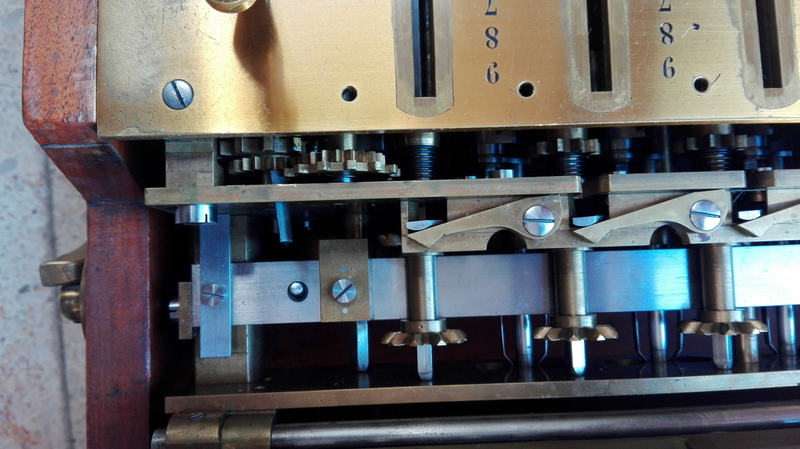 All of that being said, in terms of technical solutions rather than execution, the machine is completely identical to a Thomas 1865, Sörensen just took this machine to the next level. 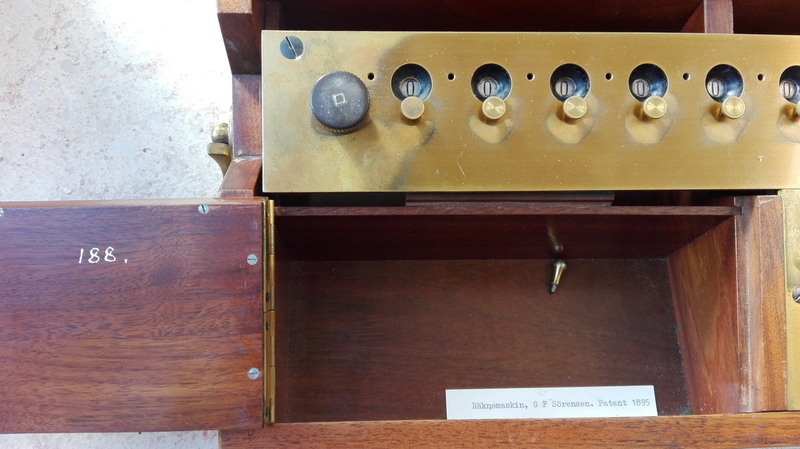 The solution for clearing must have seemed archaic by 1900, and even Thomas/Payen had moved on to the P3 model with some modfifications to the tens' carry by 1897 (see arithmometre.org) . 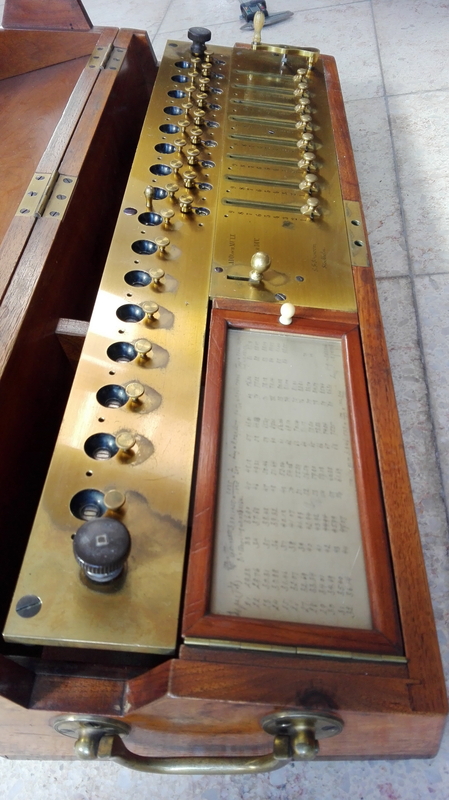 So this machine was outdated as soon as it came to the market, and it certainly was by 1907, when Sörensen died and production stopped. We have no indication whether Payen was aware of a Swede copying "his" machine, or whether any licensing fees were paid at all. 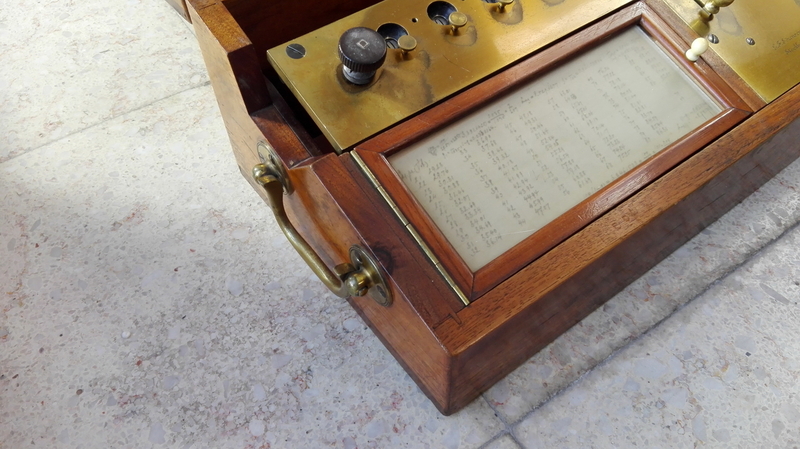 The machine in any case is a joy to behold and to calculate with. 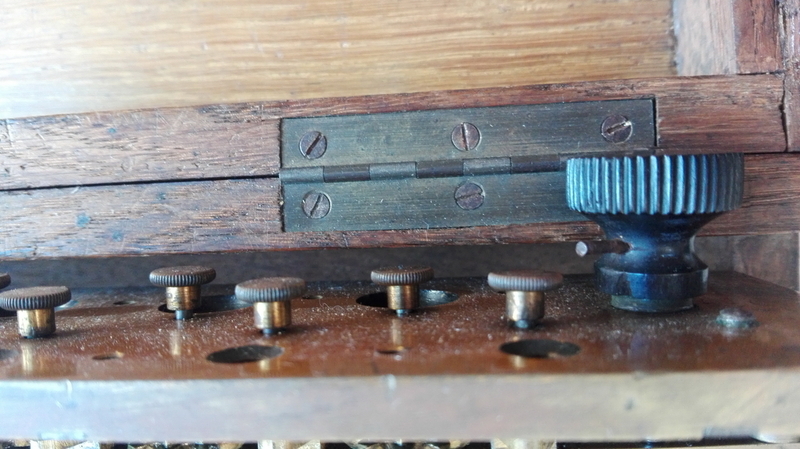 Thank you, and hat off to Mr. Sörensen for such skillful and beautiful construction!